The hacksaw is used to cut steel and other metals. It can also be used to cut plastics, although it is not normally used to cut woods. 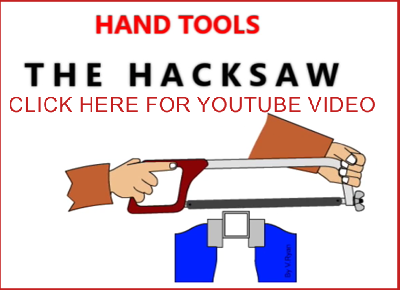 It is sometimes called an adjustable hacksaw because the length of the frame can be altered to hold blades of different sizes. Blades are supplied in two lengths, 250mm and 300mm. 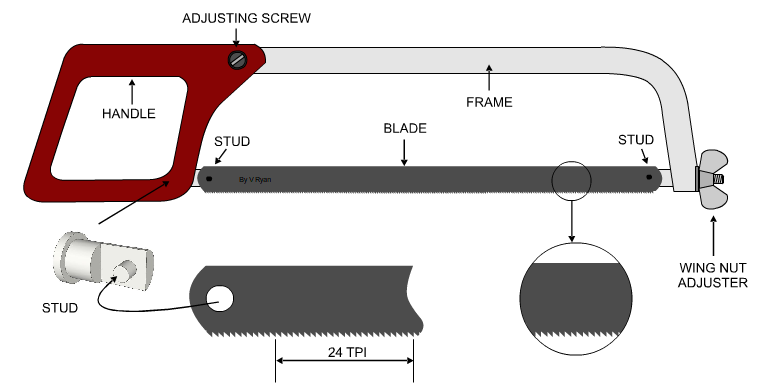 If the adjusting screw is unscrewed, the frame can be pushed into the handle so that the smaller blades fit the hacksaw. Blades are also described by the number of teeth per inch (TPI). Blades have 14, 18, 24, 32 teeth per 25mm (inch). A blade with 14 TPI is coarse whilst a blade with 32 TPI is very fine. Blades eventually wear or break and need replacing. The blade can be replaced by loosening the wing nut adjuster until it comes off the two ‘studs’ that normally hold it in tension in the frame. A blade should always be positioned with its teeth pointing away from the handle. Two types of hacksaw blade are generally available. High Carbon Steel blades are used for general cutting/sawing. They do not last as long a High Speed Steel blades. These are much more expensive but keep their cutting edge for longer and are suitable for cutting hard materials such as stainless steel and alloys.